I am not too fond of salads (unless it's fruit salad) and I'm definitely not proud to say that. I would love to include fresh greens in my diet and I think this recipe is a good start. The only salad that I ever enjoyed was this Middle Eastern salad that a Syrian friend of mine prepared for me a couple of years ago. She explained to me that the salad was of Lebanese origin. However, the name of that dish did not stick to my mind as the dish did. I initially did not want to eat it, but took some only to taste, and to my surprise I ended up liking that salad so much so that I took some home with me. It was very flavourful and she served this salad with something that looked like a pizza (a delicious oven-baked flatbread with a filling on top) and dolmas, that means stuffed and cooked vine leaves. Mediterrenean salads are well-seasoned unlike the fresh/raw and unseasoned salads that you get here and I figured that must be the reason I liked this salad so much. You could reduce or increase the amount of vegetables and seasoning as per your liking (this is not a baking recipe after all). I personally modified this (I skipped the tomato for example as we have a family member who does not tolerate tomatoes so well). Because of the generous amount of chickpeas, this salad is very hearty and filling and can be eaten just the way it is as a snack, or as a side dish or stuffing to pita bread. I prefer to prepare the chickpeas from scratch but you could use canned chickpeas if it's more convenient to you. To prepare the chickpeas from scratch, wash and soak 1 cup of chickpeas covered for about 10 hours. Drain and boil the chickpeas (in at least 4 times as much water as chickpeas) with salt. Boiling them should take about 45-50 minutes at medium to high heat. Once cooked, drain and put aside to cool at room temperature until needed. 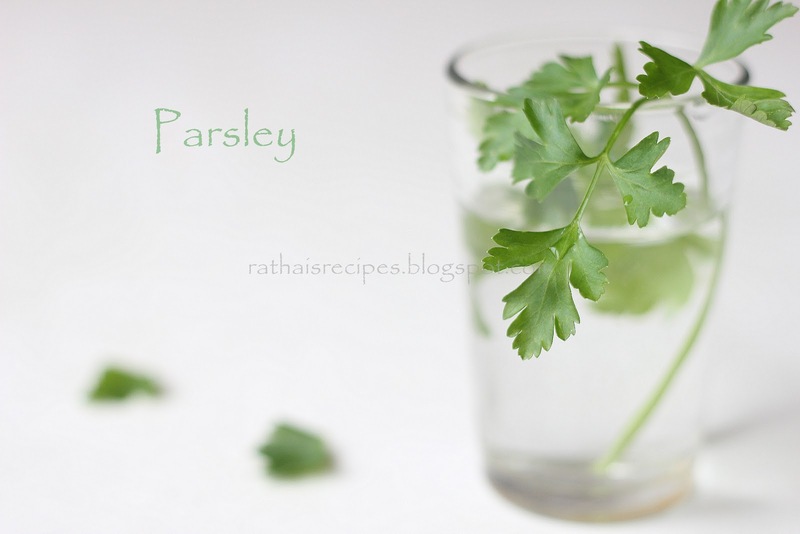 Chop parsley finely with a food scissor or knife. The parsley was instead added in generous quantity. Chop the red onion finely and put aside both in a bowl. If you want to add tomatoes, chop and add them in the same bowl. You could cut the feta cheese in dices or crumble them into the salad. 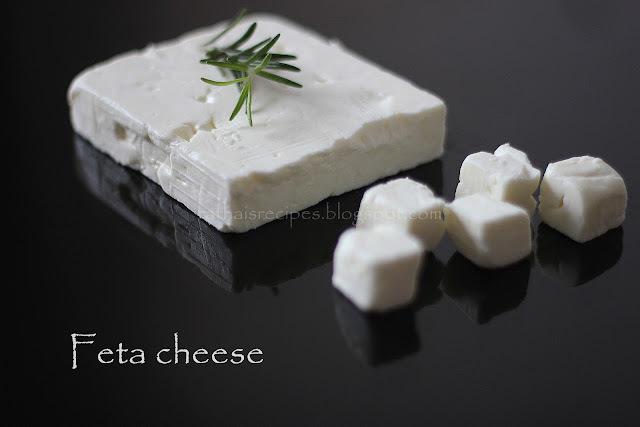 Feta cheese is quite sour and saltish in taste hence I personally prefer to crumble the feta cheese in the salad (you wont react to the saltiness as much then). Crush and grind the garlic into a fine paste. We love garlic and are quite indulgent with garlic in our cooking but eating them raw, even in a salad, is quite unthinkable to me. I had some roasted garlic (infused in olive oil). I had prepared this a couple of days ago to bake Focaccia and had enough left to use in this salad. Place all the vegetables in a bowl. Prepare the dressing by whisking lemon juice, salt, pepper and olive oil. Add the ground garlic in the dressing. Drizzle the dressing over the vegetables and toss them. Add the feta cheese and the chickpeas. Gently toss and serve. I can eat sundal rather than salad! LOL! hearty n yummy salad...never tried with any kind of cheese,looks so yum..Thank you so much for linking to my event. btw...your qstn reg camera lens-i use Nikon DX AF-s Nikkor 18-55mm lens...y ?! 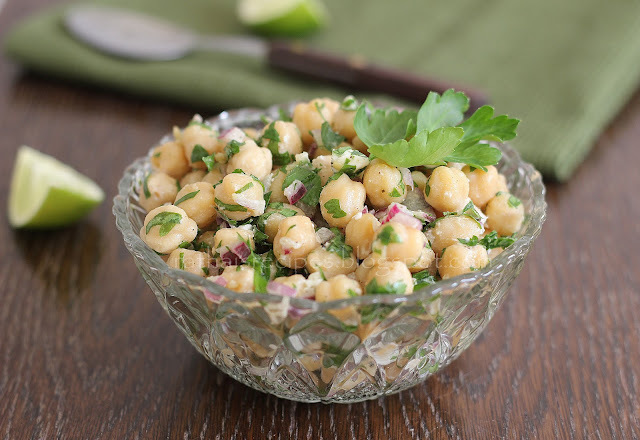 I absolutely love chickpeas and the salad is perfect. Thx for linking to the event. Sangee, I know you don't like cheese. :D Thanks for the answer. I asked because I thought you used Canon. Vardhini, me too. As a matter of fact everyone in my family loves chickpeas, and this disappeared fast. I love all types of salad and am always look for new salad ideas outside of the regular spring mix/lettuce types. Looks great! Vicky, I wish I was like you. :) I hope you like the flavours as much as we did. Like the combination of ingredients used, adding feta cheese and dressing definitely brings the awesome taste to the salad. delicious salad dear with chick peas ...adding feta cheese to it definitely brings out the flavor !loved ur presentation n clicks dear ! I love all sorts of salad. This one looks incredible. Thanks for sharing, adding it to my list. Hi Rathai! Chickpeas are not very common ingredients in Japan but I've seen a lot of people cooking with it and I'm very intrigued to cook it. Your salad looks very delicious! I appreciate your eagerness to participate in the event. Could you please tell me what is exactly the problem you are facing? I do see that you have linked to the Linky tool. Do you mean that you can't edit your post with the Logo and link?? I understand now what your problem is. Actually, you need not do anything at all with that Get Code thing. That is something for those who want to have a linky tool in their own blog. If your intention is just to link your post as an entry to our event, you need not worry about this at all. Thank you all for the comments and kind words. Oh, this sounds so lovely and flavorful!!! And a nice change from the normal green salads~delish! Kaveri, thank you for your kind words and I'm truly sorry for not having added to follow me widget. You'll have to excuse my laziness. If you look around this blog, you'll notice that there's room for much improvement. :) Thanks for pointing this out. That is a simple salad and I guess this is a great start for people who don't like salads. I love those two pictures the parsley and feta cheese... its awesome. I love salads like there is no tomorrow! This salad looks very healthy and tasty. Nice clicks. looks yummy n perfectly done..heathly salad 2...nice. Well, I love salads and this one looks perfect. It's simple and lots of flavors and textures. Love the simple dressing. Beautiful! I am a huge fan of salads...this is right up my alley! Fabulous photos too. Måste få fråga om du bor i Sverige? Love salads like these. I make a similar version but without the cheese. You have a lovely blog. Will keep coming back for more..
Rathai, this is such a refreshing treat with chickpeas and makes an awesome snack! Glad you stopped by my blog,Rathai. Thrilled to meet a fellow Srilankan blogger as there are only a few.Which part of SriLanka are you from ? Love chickpeas in any form and never thought of combining it with feta though I use it a lot.This is a must try.Love the Dodol post ! Hmm it looks like your blog ate my first comment (it was extremely long) so I guess I'll just sum it up what I submitted and say, I'm thoroughly enjoying your blog. I too am an aspiring blog writer but I'm still new to everything. Do you have any suggestions for beginner blog writers? I'd certainly appreciate it. Great information. Lucky me I recently found your website by accident (stumbleupon). I have book marked it for later! Surfade mig hit en aning av misstag, men du har någon superfin blogg här! Fortsätt med det fina arbetet!